Intravascular ultrasound (IVUS) is a tomographic imaging modality performed during coronary angiography that allows the simultaneous assessment of lumen, vessel wall, and atherosclerotic plaque. IVUS has been established as the method of choice for the detection and serial observation of transplant vasculopathy, and more recently, for the serial observation of atherosclerotic plaque burden in atherosclerosis progression/regression trials. When performed by an operator familiar with interventional, percutaneous techniques, the rate of complications during IVUS imaging is exceedingly low. 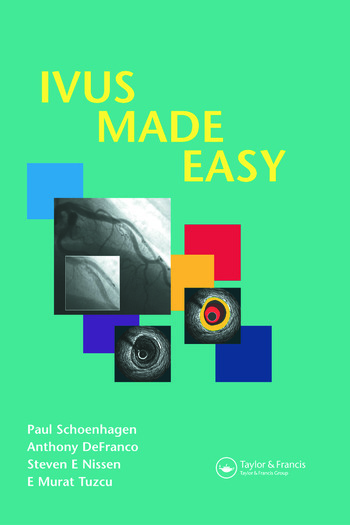 IVUS Made Easy provides an introduction to coronary imaging with intravascular ultrasound (IVUS). It consists of a brief, practical text and corresponding illustrated IVUS images. The format is uniform throughout, with a non-illustrated IVUS image displayed together with an illustrated copy. Based on the previously published An Atlas and Manual of Coronary Intravascular Ultrasound Imaging, this guide provides expanded descriptions of the practical aspects of IVUS and includes additional information in short case presentations. The book begins with the principle of IVUS imaging. It discusses normal arterial anatomy by IVUS, image artifacts and IVUS measurements. It then discusses plaque (atheroma) morphology and clinical applications.